Here is an illuminated manuscript painting from the 15th century Froissart’s Chronicles. It tells a very disturbing story. (See more below). 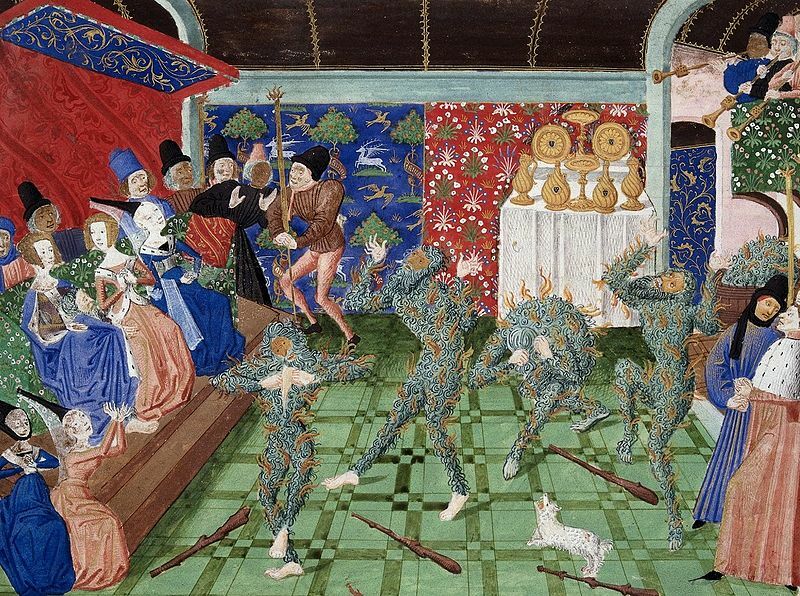 The Bal des Ardents (Ball of the Burning Men) or Bal des Sauvages was a masquerade ball[note 1] held on 28 January 1393 in Paris at which Charles VI of France performed in a dance with five members of the French nobility. Four of the dancers were killed in a fire caused by a torch brought in by a spectator, Charles’ brother Louis, Duke of Orléans. Charles and another of the dancers survived. This event was a reference for Edgar Alan Poe’s frightening story of revenge, “Hop Frog.” King Charles VI almost burned to death. He had episodes of madness before this event and it got worse afterward. Another dancer was able to survive only by jumping into a wine vat. This entry was posted in illuminated manuscript, Medieval and tagged art, horror, illuminated manuscript, masquerade, Medieval, Poe. Bookmark the permalink. The Froissart’s Chronicles is pretty amazing. It’s sort of strange how this ghastly event would actually be included but I guess it was their way of recording history!